Often I see children who explode over what parents and teachers consider small things. It is common in children with ADHD because these children have difficulty with regulating their own emotional responses. Anger, irritability, screaming, frustration, crying, sadness all seem to occur in a nano-second if something does not go their way. This also occurs if something is requested from them, something is changed in the plans for the moment or day, and/or some rule is broken by others or by themselves. There are many triggers and these are only a few. If we take a step back and examine why these emotions are so close to the surface, we may be able to help your child learn better control. 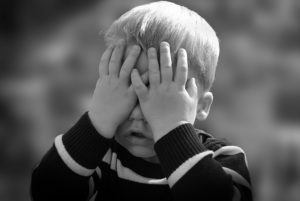 Most often, an explosion occurs when a child does not know what to say or do and does not have the set of skills required to handle the situation. As an example, imagine an elementary school classroom with a wonderful teacher and a student John. John is asked by his teacher to put his math paper away since the class will be moving on to work on spelling words. John is not finished with his math assignment and this happens frequently for John since he works at a slower pace due to his ADHD (he is NOT slow due to lack of intelligence). He feels like a loser, like he is dumb because he cannot finish work in class and he is very tired of taking work home as homework! This situation may result in any of the following: John crying and shutting down, John refusing to put the math paper away, John angrily refusing with words like “I’d be better off dead” “You think I am dumb anyway” or John making threats like “I’m going to stick my scissors into Jane” (who just happens to be sitting next to John on this day). What are the factors involved and what does John need in order to better cooperate? John has difficulty transitioning just like many kids with ADHD. Their mind, when focused, is sometimes “hyper” focused. This explains why some kids can spend hours and hours playing video games (hyper focused on something they like) but cannot focus on things that are not interesting to them. For John, he loves math and he wants to finish his math work. In addition, he rarely finishes his class work since he works at a slower pace. It seems that children with ADHD either rush to finish and make careless mistakes or are perfectionistic and fail to finish. John is the latter. By the way this has nothing to do with intelligence, in fact, most ADHD children are very smart! What does John need in this scenario to help him better cooperate? John needs advance notice that he will need to put his math paper away. For example, the teacher could have a private signal with John such as a touch on the shoulder to let him know that he has 5 minutes left, then 1 minute left, and then signal him to look up and listen when she announces the request to the entire class. John may need certain accommodations that allow incomplete papers to be finished at school or not at all. Kids (of all ages) need downtime and play time after school. John could easily spend his entire evening struggling to finish work that his classmates finished in class. This adds to John’s frustration. John needs to know that he can leave the classroom if he feels very overwhelmed. Having a predetermined place, usually a counselor’s office, where John may take a break will allow him to calm down and allow the class to not be disrupted. Counselors can be helpful in teaching John the skills he needs to handle frustration. John needs to learn skills of self-calming such as taking deep breaths, counting in his head to 5 or 10, focusing on a focal point (can be anything) that takes his mind away from his frustrations in the moment. It takes time for these efforts to help John reduce his outbursts and feel more confident so patience is essential! All of these efforts between teacher, counselor, John, and his parents will help John avoid losing emotional control and exploding in the classroom. Often just realizing that your child “wants to be good” but sometimes does not have the skills to regulate emotions, is a start to problem solving. Being patient, having a teacher who understands, and having help from other school personnel can all be very important. Also, when your child has lost control, please understand that continuing to threaten consequences, continuing to demand a certain action or behavior, continuing to scream louder than your child will just lead to prolonged explosion. A child in the middle of an explosion cannot hear you since their frustration is so intense. Your child needs a safe place where he/she can calm down. If you want to discuss the explosion and what behaviors you would rather see, then wait until the storm has passed and calmly and quietly speak with your child.